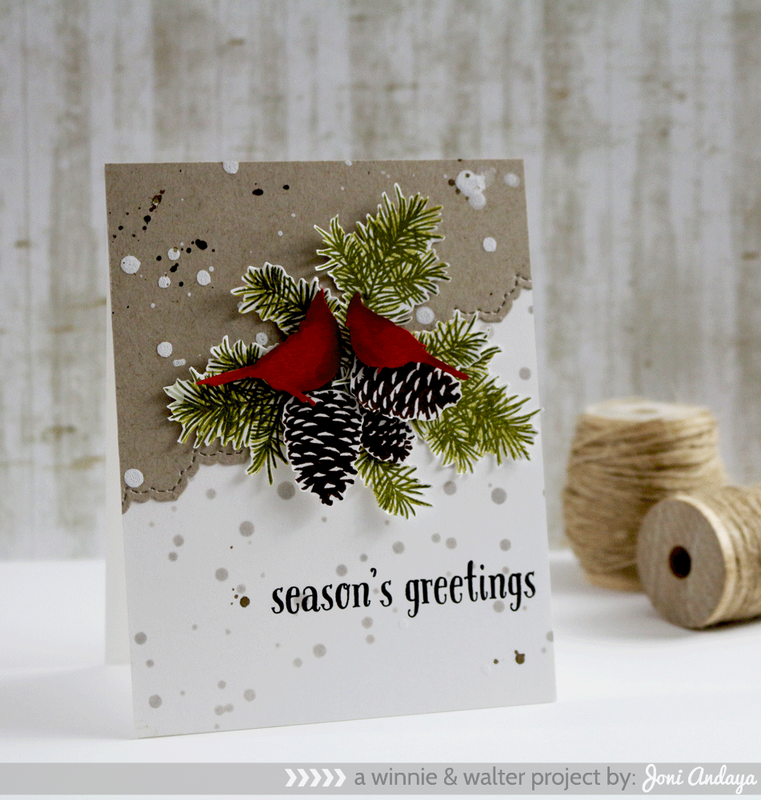 Hello Everyone we are back with day 2 of Winnie & Walter October release. Today I am showcasing this awesome set called Winter Woodland many awesome images you can play with. To begin my card I first used one of the upcoming Creative Screenings called Scenery: Big Bang Circle. I placed the creative screening on top of the white card base then smooshed the grey chalk ink on top to create the falling snow background. Next I die-cut the kraft cardstock slated using the Pretty Pink Posh Stitched Border 2 dies, I used the elegant stitched. Next, I splattered the kraft and some in the white using Mister Huey's in brown and October Afternoon sprinklers in paper doily (white). Then, I stamped all the images I am going to use on the white cardstock then fussy cut each one (birds, bough, and pine cones). The sentiment is also from the same set. Wow wow wow!! So gorgeous! I loveeeeeeeeeee those pine cones!!!!!!! Absolutely beautiful card :) Love it! Wow wow wow. Just beautiful. Joni, this is spectacular, and it looks like just the stamp set I've been waiting for! Beautifully done! Such a fabulous card! I love it! Love it. Can't get to the winter wonderland set to pull up. Has it been released yet? You are just too good Joni :) this is a gorgeous card! Joni, I actually had to do a double-take on your card! I thought it was actually REAL pine and pinecones on your card! Tremendous job on showcasing this stamp set! Eager to see this one released by W & W! Stunning Joni, the pine looks so lifelike!!! Sigh.... Another must have set. Your card is stunning! oh man, I was hoping there were dies to match! hehe Beautiful card Joni! This is a beautiful card, love it! Gorgeous card Joni. 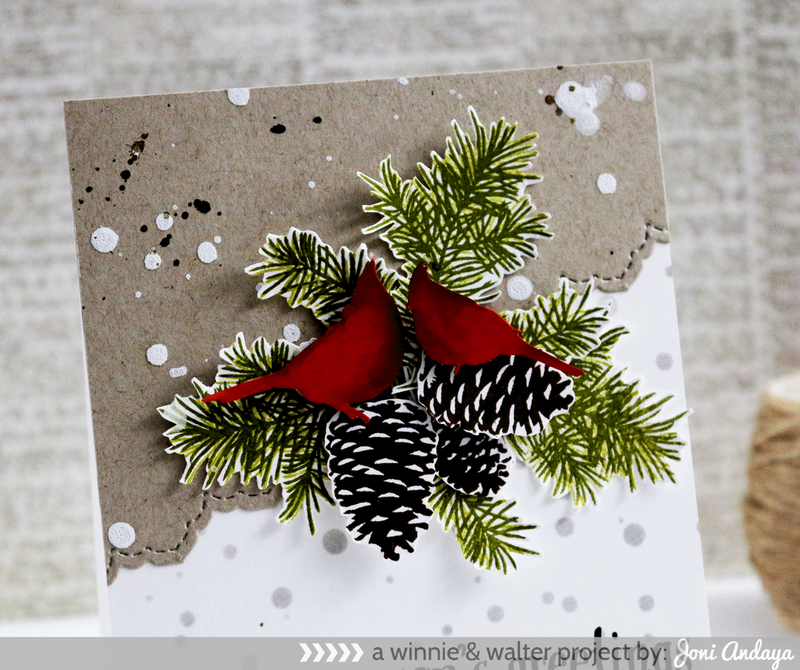 I love those gorgeous pinecones - they look almost 3D. Beautiful card Joni. Love the Kraft and White background with the pretty greenery and birds. I will have to CASE this. Love the design so much. I love this card so much. I wish there was a die because I never could cut out those pine branches as well as you did. You have an excellent eye for beauty :) love ur gorgeous creations ! Oh my, this is amazing.